Here’s one of my easiest hot dinners; a great result of being in a rush and experimenting with just throwing food in the oven. One pan in the oven, and only 15-20 minutes of your time. Plus it is healthy and delicious. During the holidays it’s nice to have a quick healthy meal like this, a bit of a break from all the heavy foods. Feel free to add some bread or rice if you wish. This is for one person, so double, triple or whatever you need. Heat the oven to 400F. Put the broccoli on a baking pan and drizzle with a little olive oil. Shake it around a little, then put it in the oven for 5 minutes. Add the tomatoes to the pan, shaking them around a little, then bake for 5 minutes more. Add the salmon to the pan, skin-side down. 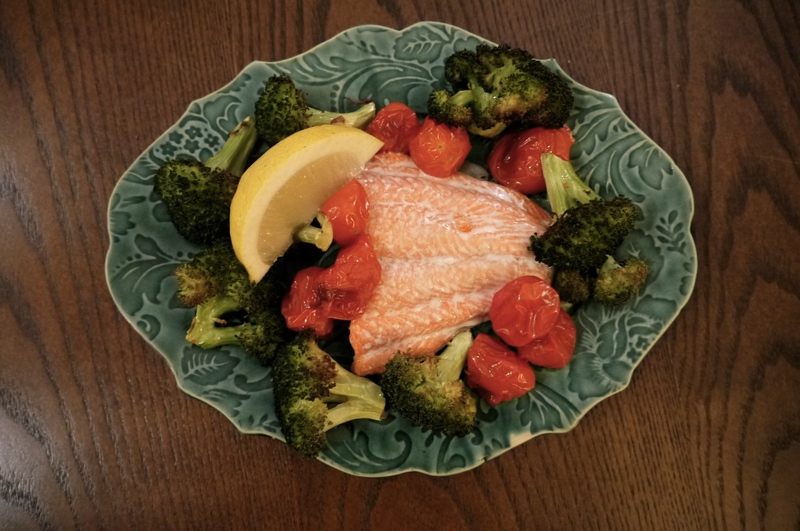 Place some of the cherry tomatoes around the salmon – I think this keeps it moister. Cook for 5 minutes more, or until the salmon is just cooked through – we don’t want it to dry out. Remove the food from the oven to a dinner plate, then add salt and pepper, and a squirt of lemon. I put lemon on everything, but the salmon is the part that really needs it. Eat it while it’s hot!